Congressional is Coming to WGT! Exciting news! World Golf Tour is adding Congressional Country Club, site of the 2011 U.S. Open, as a full stroke play course to the WGT golf game in 2011. You’ll start seeing banners on WGT promoting a Sneak Peek of Congressional, a one-shot experience on Congressional hole 2, which is a challenging par 3 with a tough hole location. The USGA is also offering a special for WGT players to purchase tickets to the 2011 U.S. Open during the Sneak Peek. In the spring of next year, WGT will launch a Closest-to-the-Hole and Full Stroke Play on Congressional, making the course available to all WGT players, as well as the annual Virtual U.S. Open that attracts millions more. Congressional is a historic golf course in Bethesda right outside Washington D.C. which is famous for being founded and played by U.S. Presidents. Congressional hosted the 1964 and 1997 U.S. Opens that were won by Ken Venturi and Ernie Els. It’s a long 7,213 yard par 70 with rolling terrain, tree-lined fairways, challenging greens and water hazards. A true “Open” challenge in real life and virtually! Congressional will join Oakmont and Bethpage Black as other U.S. Open Championship courses on WGT, all part of our long-term partnership with the USGA to host the Virtual U.S. Opens. WGT is also working on adding several other top golf courses in 2011 so stay tuned. An unconventional swing can still win a player a prestigious award. 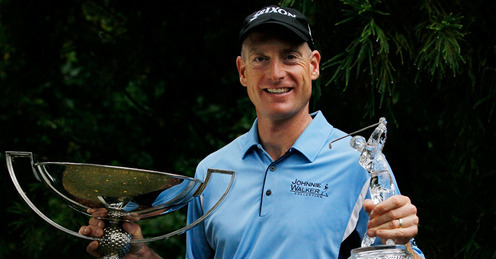 Jim Furyk, a three-time winner, was named the PGA Player of the Year by the PGA of America. Thanks to Furyk’s strong finish with his victory at the Tour Championship, he earned enough points to edge out Matt Kuchar and Steve Stricker. Furyk collected 60 points, while Kuchar and Stricker received 50. Ernie Els and Phil Mickelson were third and fourth in the standings, respectively. This is the first year Furyk has received the award. He’s also the first American not named Tiger Woods to win it since 1998. Keeping in the spirit of firsts, Furyk won three titles, the Transitions Championship, the Verizon Heritage and the Tour Championship, for the first time in his career. He also was the first player to sleep through his pro-am starting time, resulting in his disqualification at an event (The Barclays). Furyk finished second on the PGA Tour money list with $4,809,622 in earnings and fifth in the scoring average standings. Meanwhile, Kuchar took home his first Vardon Trophy for low scoring average. He was a bastion of consistency in 2010 with 11 top-ten finishes. 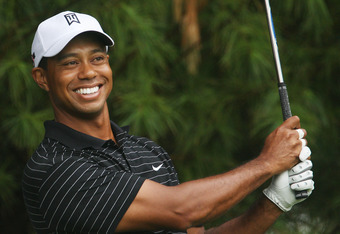 He also finished the season as the PGA Tour money leader with the $4,910,477 deposited in the bank. In 97 rounds, he posted a 69.71 adjusted scoring average, .05 lower than Stricker (69.66). Paul Casey and Retief Goosen shared third at 69.72. What’s more impressive is that Kuchar played more events than those guys (so there was more room for error). The PGA Tour Player of the Year is still up for grabs. That contest is decided by the players who vote for the peer they think is most deserving. Last year Tiger won. (Since he took a leave of absence, does that qualify him for Comeback Player of the Year? Kidding!) Will it be a Furyk sweep? Methinks so. Since the PGA uses a points system to determine the POY, it’s tough to contend the result — not to mention Furky’s three victories, along with winning that FedEx Cup thing — but if it were decided by votes, who would you have picked? Heads up! We will have a scheduled maintenance windows starting at 11pm PST lasting for about 4 hours. Thanks for your patience. We will have a short maintenance window starting at 11PM PT on November 10th which will last for less than an hour. Make sure to save your games prior to this time. We apologize for any inconvenience. Lee Westwood has taken over the top spot in golf's world rankings from Tiger Woods, but the Englishman's reign at the top of the golf world could be short-lived. Tiger Woods, Martin Kaymer and Phil Mickelson are all in position, with a strong showing at the HSBC Champions in Shanghai, to possibly move up ahead of Westwood and claim the top spot. Westwood ended Tiger's run of over five years (281 consecutive weeks) at the top of the rankings, taking over the complicated rating system by winning only one tournament all year and hardly playing the last few months due to two separate injuries. Interestingly, Westwood becomes only the fourth player to reach the top spot in the rankings without ever having won a major championship. The previous three were Fred Couples, Ian Woosnam and David Duval, all of whom won majors later on. The 37-year-old Westwood also becomes the first European to top the rankings since Nick Faldo was number one 26 years ago. The WGC-HSBC Champions tournament in Shanghai features an incredibly strong field. The top four will all be there (Westwood, Woods, Mickelson and Kaymer), as well as Graeme McDowell, fresh off a win in Spain, and the likes of Rory McIlroy and Ernie Els. Westwood has 32 professional wins and finished second this year at both the British Open and The Masters. Ryder Cup captain Colin Montgomerie thinks it will be tough for Westwood to stay on top for long. "Once you are No. 1 you want to stay there," Monty told the BBC. "You've got to improve because the standard behind you is improving. "It might be the end of Tiger's reign for a limited period, but I don't think he will be very happy about being two or three in the world." Woods has reportedly continued to work on reinventing his swing with coach Sean Foley, and has played fairly well the last few months after really struggling through the first six months of the year. Tiger played very good at the Ryder Cup, taking three of a possible four points. Mickelson could also get to the top of the world rankings in China, although he has failed on 13 separate attempts in 2010 to take over No. 1 from Tiger. Martin Kaymer, who could have taken over the No. 1 spot by finishing first or second in Spain, could also get to the top in China. With all the problems with the rating system, it seems like for now at least, to stay at the top, whichever player is there (Westwood, Woods, Mickelson or Kaymer) will have to play well to retain his position. Isn't that a crazy thought?